Here at PB Metal Finishing Systems, our range of powder coating ovens, or stoving ovens, meet almost any application need you may have. Whether you’re looking for a small standard model or a custom designed installation, we’re here to see that all your needs are met. With temperatures available from 50oC to 500oC, we manufacture and supply our industrial powder coating curing ovens either as a production conveyor oven or a conventional batch version. The requirements you have for your powder coating oven is completely unique, and by manufacturing our ovens to a modular design, we can construct a unit of almost any size and shape. As your powder coating oven will be made to meet the requirements of your company, you can rest assured you’ll soon start enjoying a range of benefits. Why Choose PB Metal Finishing Systems For Your Powder Coating Ovens? If you’re looking for a cost-effective solution without compromising on the quality of your industrial paintwork, PB Finishing Systems is here to help. 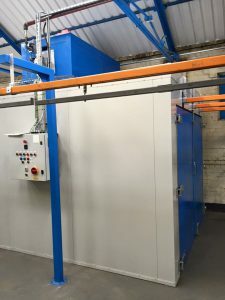 No job is too big or small for us, and our dedicated team are highly experienced in fabricating and setting up powder coating ovens that are made to your specific requirements. We offer an unparalleled level of customer service, with a member of our team coming to visit your site in order to ensure we understand exactly what you want before presenting you with a design and quotation. Once you’ve accepted, we’ll work closely with you to organise the installation of your powder coating oven for your complete peace of mind.